It was Thursday night and we had been on a tear all day. We had climbed and descended some significant mountains and covered more than 9 miles. We were miles from civilization and had just stopped for the night at what appeared to be a great site to pitch out tents and eat. The site was perfect until the hail started pelting us. Pea sized hail started beating our weary bodies as the ground went from clay to ice in a few short moments. At the moment, I had set my tent wrong-side out and backward. Benj was trying to help me, so we could get in our tents and find cover. I know what you’re thinking, and no, there was no other shelter. So on we went, until The hail lightened and the rain followed it. Once in our tents, everything was once again, soaked. It was cold, and wind gusts at that altitude were in the 40+ mile per hour variety. We got out of our wet clothes and into drier clothes. We fired up our camp stoves in the tent to try and dry out and warm up. We were high enough to have spotty cell service and started texting our wives. You know what is impossible? Trying to convey the mess we were in with no video. Jenny was ready to send out the National Guard, or maybe just Phil Wasden. I was more concerned with not freezing. 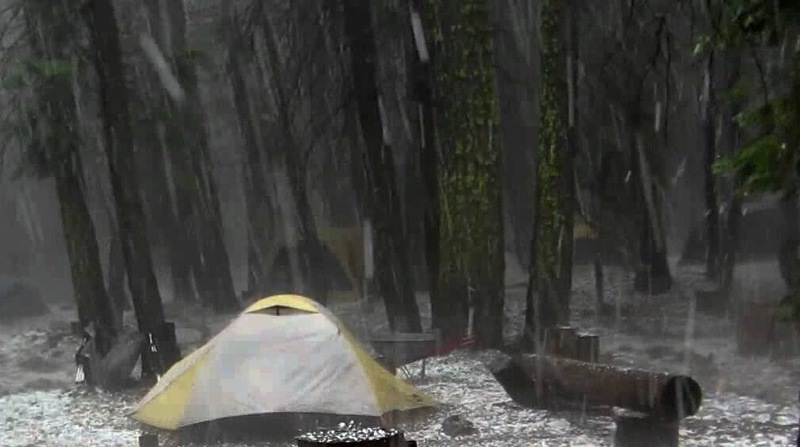 We did get warm and dry, and the tents proved to be tough enough to endure, yet another storm. The next morning, we started our hike out to civilization. The lesson learned in this weird spectacle? Stay calm, don’t panic, and don’t let your brain focus on what if’s? This story is a tiny part of a six-day journey, but it is a reminder that the evening may bring hardships, but joy comes in the morning. Your day might be headed south, but a fresh breeze of north bound goodness is right around the corner. No matter how dark your circumstances are today, new mercies await you tomorrow! What seemed like an awful experience, is now a funny story. What appeared to be a mess, was a blast! What came with fear and misery, became a victory. Maybe your marriage is in the tank. Maybe you are lonely and miserable. Maybe the doctor said you have cancer. Maybe your bankruptcy court date is tomorrow. Regardless of what your current challenges are, you have to endure them to find the treasure hidden in the tragedy. I can’t wait to get back on the Appalachian Trail because I know that I’ve taken the best that the mountains could throw at me. I can’t wait to learn a new lesson and experience the thrill of thriving in the storm. All of life is a lesson. You get to choose what you will do with your lessons. Instead of wallowing in them with pity, fire up your camp stove, make some coffee and endure the storm til the morning comes. When we choose to learn and then change, we begin to see the storms as a necessary core curriculum for life, love, and leadership. Don’t quit! You might be one night away from victory, but you’ll never know if you stop.